It was another embarrassing primetime showing by Andy Dalton and the Bengals that drops them to 4-3 and second in the AFC North behind the Steelers. No one thought the Bengals would win this game, but did we think it would be close? Of course we did. The Steelers loss hurts less than this game because at least the Bengals were competitive in that game. The Sunday night performance perfectly sums up the repeated mockery we continue to get with Marvin Lewis. The season is not lost by any means, but the Bengals have to figure out a way to get back on track. This week the Bengals play Tampa Bay. It’s another game that is supposed to be a shootout, which after last week, may not be a good thing for the Bengals. The Bengals looked flat on offense and only managed 10 points against one of the worst defenses in the NFL. Sounds similar to this week, where the Bucs have a very explosive offense, and a very bad defense. Bill Lazor must figure a way to get points on the board. Dre Kirkpatrick vs. Mike Evans – News broke earlier this week that the corners for the Bengals will at least start the game shadowing. William Jackson gets Desean Jackson, which doesn’t scare me too much. However, Dre is shadowing Mike Evans. Dre has struggled at times this year but is still not having as bad of a season as many are making it out to be. All fans will be glued to this matchup to see how Dre handles going up against one of the best wideouts in the league. The Bengals Defensive Line vs. The Bucs Offensive Line – I listed the Bengals defensive line as a key matchup last week and will continue to do so until they step it up and show us what they showed in the preseason. Last week they failed to get pressure on Mahomes and he picked apart the defense. Jameis Winston, with time, can do the same thing. However, we have seen Winston struggle under pressure and make bad throws. If the line can step it up and get pressure on Jameis, it could lead to key turnovers in this game. Andy Dalton vs. The Bucs Secondary – The Bucs secondary is bad, maybe worse than the Chiefs. This could be a get right game for Andy Dalton and Bill Lazor. The offense has struggled in the last three weeks. This game could turn into a shootout quickly and Andy Dalton must perform and show fans why many have stuck with him this long. If he cannot perform against this team, it may start to raise some questions. My Prediction: Two straight loses, this game is a must win for the Bengals season. They cannot afford to go into the bye at 4-4. On paper, the Bengals are the better team and if we see the Bengals from Weeks 1-4, Cincy will win this game and move to 5-3. However, if we see the Bengals from Weeks 5-7, I think it goes down to the wire and Cincy may even lose. I’m giving the Bengals the upper hand and trusting them. I think at home they get back on track and go into a much needed bye at 5-3. Be sure to follow me on twitter @Pierson242FF, and be sure to tweet me anything Bengals related, questions or comments! Not a bad start for the Cincinnati Bengals. In fact, a good one. A very good one. Cincy opened the 2017 preseason with a 23-12 win over the Tampa Bay Buccaneers on Friday night. It was a welcome sight to see the Bengals back on the field, and while the team never truly pulled away from the visiting Bucs, they didn’t disappoint either. Quarterback Andy Dalton and the offense were Merlot-smooth on the first drive until the last play. 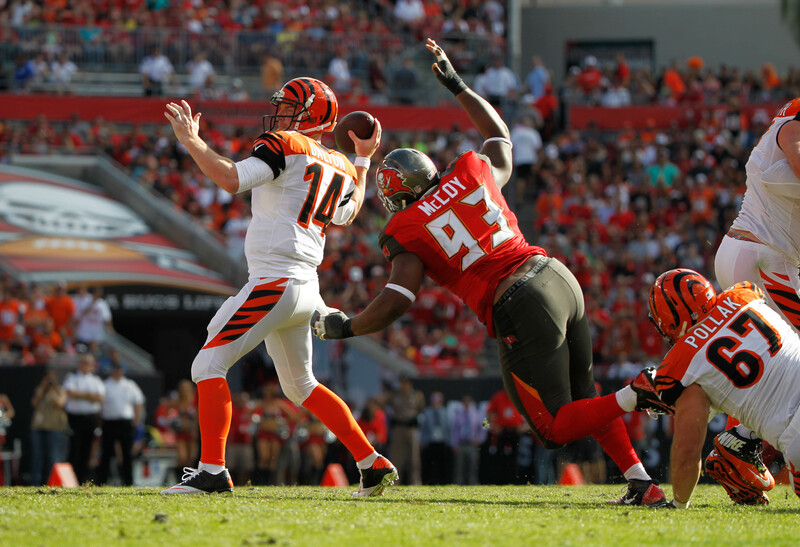 Dalton completed four of five passes for 38 yards and AJ Green had two receptions for 21 yards. Granted, the drive ended when Dalton threw an interception to Vernon Hargreaves III at the 1-yard line, but it was Cincinnati’s only turnover of the game. Vontaze Burfict is in his contract year, and he’s already playing like it. He notched two tackles and looked super quick. The defense as a whole allowed 330 yards and one first-half touchdown. But there was no glaring weakness and no big injuries. All in all, it’s reason to get excited about the things to come in 2017. This one may surprise you – the kickers. Randy Bullock (field goals of 54 and 49 yards) and fifth-round draft pick Jake Elliott (45) showed plenty of leg strength and accuracy. Even better, there were no misses. If last night’s refs were waving their arms side to side on those field goals – which happened waaaaay too much last year – then the game gets a lot tighter and the players play that way. Which is not what you want when you’re down by a score at the two-minute warning. Don’t get us wrong … there were some causes for concern last night. Andy Dalton threw an interception at the 1-yard line on the opening drive. The offense didn’t score a TD until the third quarter, when the first stringers were already on the sidelines talking about which clubs they would hit after the game. The D gave up several third-down conversions. But we’re happy. Like, cue-the-Pharrell-Williams-song-and-get-some-Minions-dancing happy. The offense moved well on its first possession before Dalton’s pick. Rookie running back Joe Mixon ran six times for 31 yards and caught an 11-yard pass, showing that he’ll give the backfield a boost. The offensive line gave Dalton enough time to find his receivers. Backup quarterback Jeff Driskel went 8-9 for 97 yards with a touchdown pass and scrambled for an 18-yard score. Josh Malone, the third-round pick out of Tennessee, also nabbed a nifty catch in the back of the end zone in the fourth quarter. The Cincinnati Bengals also did not look short for defensive ends. Carl Lawson and Jordan Willis each had two QB pressures. Willis also collected his first sack. Free agent signee Chris Smith (from the Jaguars) was disruptive in the second half. Adam Jones, who is suspended for the season opener because of his January 3rd arrest, broke up two red-zone passes that forced Tampa to settle for a field goal in the 1st quarter. Next up – Saturday, August 19th vs the Kansas City Chiefs. We can hardly wait. The Bengals placed DE Jamaal Anderson on season ending injured reserve today, Anderson tore the quad tendon just above his knee near the end of the game on Sunday. Veteran DE Wallace Gilberry was signed today to replace Anderson, Gilberry was signed in 2008 as a college free agent out of Alabama and spent 4 seasons with the Kansas City Chiefs where he accumulated 14 sacks from 2009-2011. Gilberry signed with Tampa in the off season and was released this past Friday. Read more.